What you’ll immediately notice, though, is a faceted chassis design that angles the corners and offsets the power connections and USB-C port. On the side of the chassis is also a small red switch that electrically disables the webcam, actually removing the driver from Windows. 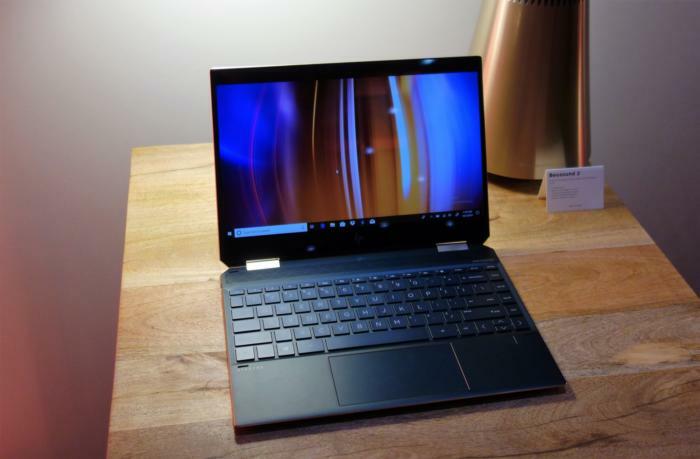 HP debuted two versions of the Spectre x360 13 in 2017, and what was noteworthy about the excellent late 2017 Spectre x360 13 was its leap to an 8th-gen, quad-core part. Intel still calls its latest quad-core “Whiskey Lake” chip an 8th-gen processor too, but there’s less of an emphasis on performance. HP believes you’ll see a boost of about 13 percent in 3DMark performance from the previous x360 generation, but a whopping 37-percent increase in battery life to a rated 22.5 hours. In part, that’s because the new Spectre x360 uses a 1-watt display panel that still manages to pump out a maximum of 400 nits of luminosity. HP designed its Spectre x360 for your professionals, with battery life among its primary characteristics. Dimensions: Exact dimensions are unknown, but it’s 14mm thin and 2.9 pounds—slightly thicker and heavier than the previous generation. Under the dim lights of a recent HP launch event, it was difficult to distinguish between the new Dark Ash Silver and Poseidon Blue colors. But the accent metals used on the corners gleam. And speaking of the corners—they’re gone. Well, sort of. 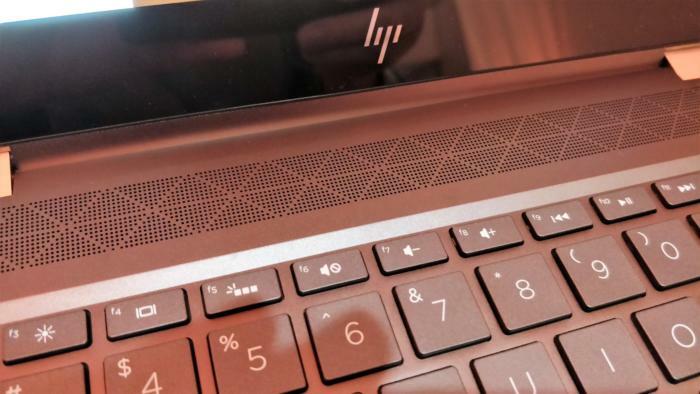 On each of the rear corners, HP has angled the corners to include a power button on one side and a Thunderbolt-enabled USB-C connector on the other. Because the new x360 is USB-C powered, that means that the power cord can be attached at a convenient angle, or connected via the side of the Spectre, using the other port. HP widened its speaker grille and reshaped it to give it a geometric bent. Honestly, the new faceted design is a bit gratuitous, as a USB-C slot at the side or rear of the notebook is just fine. But HP has always tried to make its products visually distinctive, and it’s a stylistic flourish that you’ll instantly identify with the Spectre line. 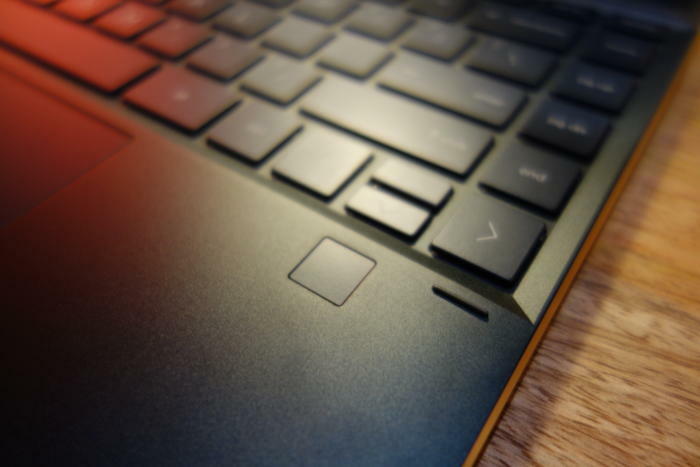 The rear corners have been squared off to give the Spectre laptops this “faceted” look. 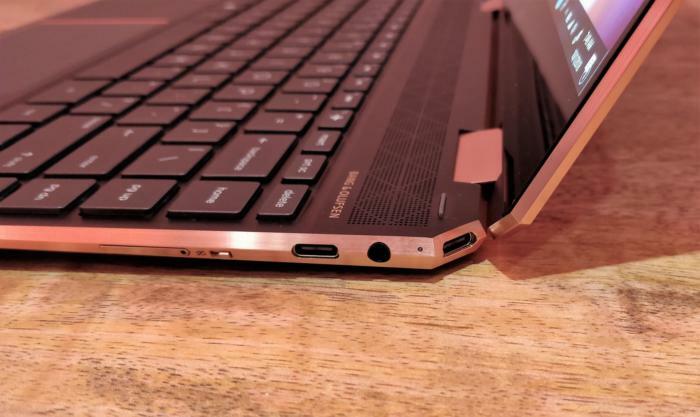 On the right side of the Spectre x360 13, there’s a pair of USB-C ports (with Thunderbolt), the headphone jack, and the new webcam kill switch. Held in the hand, the Spectre x360 (2018) was both bright and light. The display can blast out up to 400 nits, even with the new 1-watt panel technology—a huge deal, and one of the most important announcements to come out of Computex this year. The new, ultra-efficient panel minimizes one of the most power-hungry components within a PC. Even though the battery remains unchanged from the Spectre x360 (2017) at 60Wh, HP executives described the reduction in panel power as one of the key enablers of its massive increase in battery life—pushing into the territory carved out by Qualcomm Snapdragon chips, but with a traditional x86 architecture. To our eyes, the Spectre x360 13’s new display appeared both bright and color-accurate. You also have the option of buying a SureView-equipped panel, which helps reduce visibility to viewers to your left and right, preserving privacy. HP also said it trimmed the bezel size by just under 6 percent, the majority at the bottom of the screen. Power plays a role in other changes, as well. The Spectre x360 13 (2018) includes an improved thermal architecture, which adds a bit of thickness and weight—it’s about a millimeter thicker, and 0.05 lb heavier. At 2.9 pounds, the Spectre x360 felt sturdy, but not overly heavy. 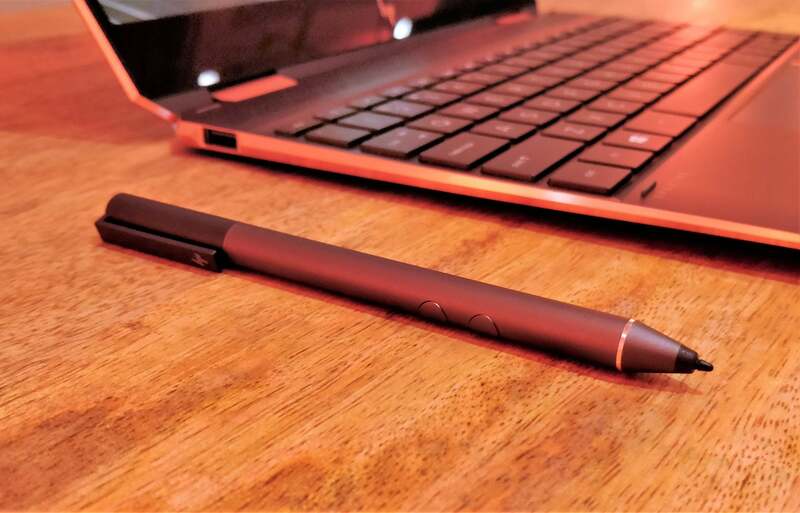 HP’s pen ships with the Spectre x360 13. Three other details distinguish the Spectre x360 13 (2018) from its predecessor, the 2017 model. First, there’s a wider, “micro-drilled speaker grille,” which allows what HP calls better acoustic transparency from the traditional Bang & Olufsen-certified speakers. What we’d expect from this would be a louder, clearer sound, but we didn’t have a chance to compare one generation to the other. The fingerprint reader has been returned to its traditional position on the palm rest. Is this a better solution than the physical ThinkShutter on the Lenovo ThinkPad Carbon (6th Gen), or the wacky pop-up webcam of the Huawei Matebook Pro X? We’ll have to test it to be sure. 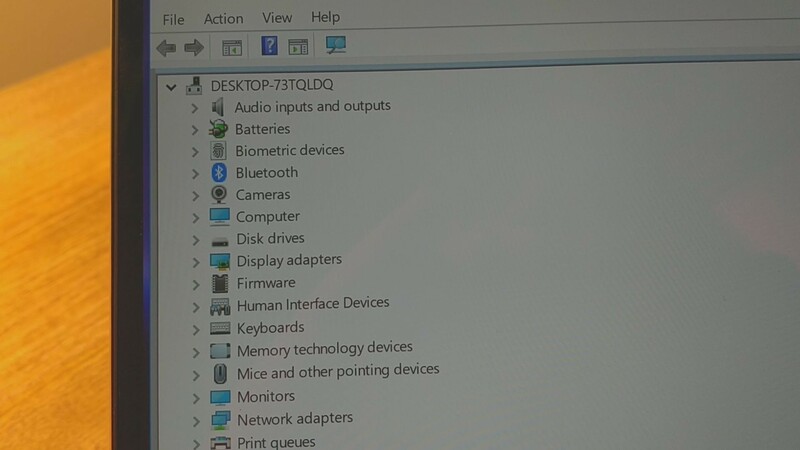 (It seems that all three solutions leave the mic enabled unless you manually disable it.) There’s also an IR camera for biometric logins. Finally, what the side of the Spectre doesn’t have anymore is a fingerprint sensor. 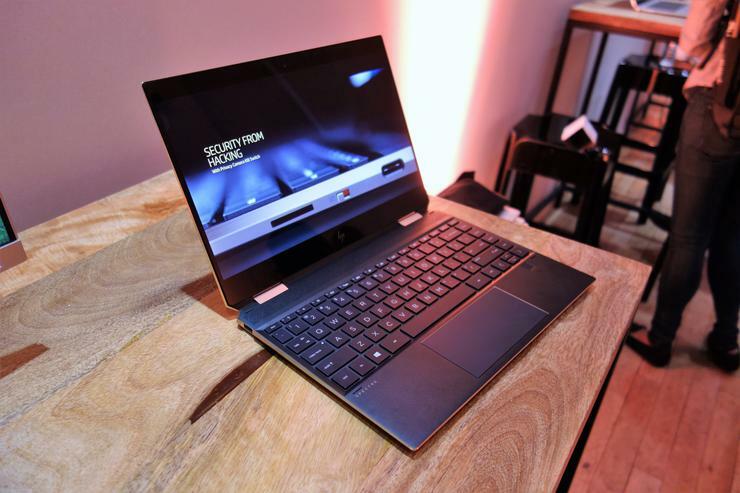 With the 2017 Spectre x360 generation, HP argued that the side-mounted sensor facilitated logging into the laptop in whichever mode it was in: a laptop configuration, tent mode, or folded back. HP now puts the fingerprint sensor where most other laptop makers place it: on the palm rest, which makes more sense. Granted, we couldn’t test a number of features in just the short time we were able to examine the Spectre x360 13, not the least of which include the new chip inside of it. Choice features like dual eSIM should allow always-on connectivity both at home and abroad, and the new gigabit Wi-Fi capabilities should speed downloads dramatically—provided you have a compatible router or access point. As for the flagship feature, battery life: Based on our tests of the HP Spectre x360 (2017), it seems that our tests usually confirm about 80 percent of HP’s claimed battery life. That would put HP’s eye-popping claim of 22.5 hours of battery life closer to 18 hours—still a massive amount. We’ll have the full report once we can get our hands on one.